Do You Need to Buy a Mobile Friendly Website? To Buy a Mobile Friendly Website or Not…. You probably have a website, right? But if it’s not mobile friendly also known as “responsive” you may be thinking about your options or wondering if buying a mobile friendly website is necessary. The experts (online marketing experts and others) have been telling us for several years that mobile search is here to stay and can not be ignored. According to Search Engine Watch, in early 2014 mobile EXCEEDS PC internet usage for the first time in history. That’s significant. What about your website visitors? OK… enough statistics from others. Let’s eliminate the guess work by diving into your website statistic. This data will will provide you with the answers you need. 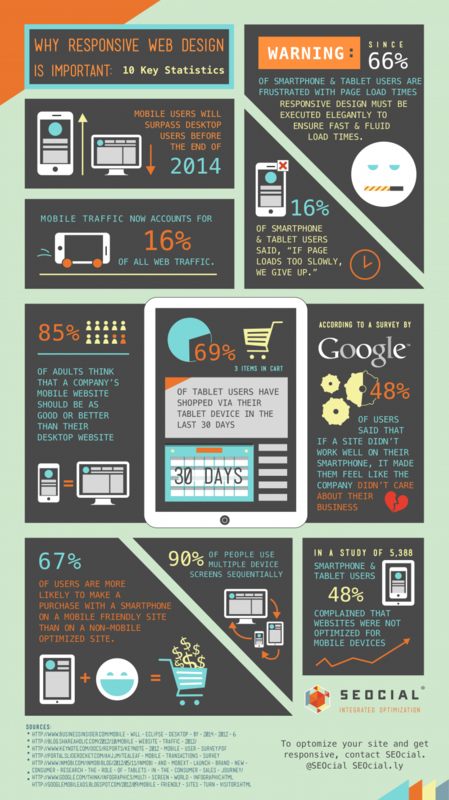 How many website visitors arrive to your website via a mobile device? What percentage of mobile visitors are new versus returning visitors? What actions do mobile device website visitors take? Knowing this data is critical and fortunately easy to answer assuming you use Google analytics or similar (you do have website analytics installed on your website, right?). Step 1: How Many Website Visitors View Your Site Via a Mobile Device? Open your Google analytics and click on mobile under the audience tab. The following chart should be displayed. Under the Acquisition section view the sessions column. Here you can clearly see how many visitors viewed your website via a desktop, mobile device or tablet. Because of my SEO background, I believe each visitor is important. And if a website had a total of more than 1-3% of its visitors viewing a website on anything other than a desktop I would think hard about making certain they had just as good of an experience as my desktop visitors. If they came to my website I assume they are looking for information about the services or products I offer. And if they struggle to quickly access that information, they will leave and find a website that does make it easy for them. Step 2: Who are Your Mobile Website Visitors? Now you know how many and what percentage of your website visitors used their desktop, a mobile phone or tablet. Great. But who are these visitors? The more you understand your visitors the easier it is for you to make many decisions relating to online marketing including whether a mobile friendly website is in your best interest. Next, under the Acquisition section let’s look at the New Sessions and New Users columns. The New Sessions number represents an estimate of the percentage of first time visits. The New Users represents the number of first time users during the selected date range. If the percentage is new sessions and new visitors is 80% or above, does this mean most visitors do not return for a second visit? Knowing how many visitors were new visitors, did you make a great first impression? Are they likely to return, tell their friends and buy from you? If you have a healthy balance of new versus returning visitors can you assume their first experience was good and they returned to learn more about your services and products? Step 3: What Actions Do Your Mobile Device Website Take? We are trying to decide if you need to buy a mobile friendly website. And we could guess all day long. The good news is we don’t have to. Once again by using Google analytics instead of us guessing we can let your website visitors answer this question for us. We can learn from their behavior. Bounce Rate column indicates the percentage of single page visits (IE visits in which the person left your site from the entrance page without interacting with the page). A visitor that lands on your website and immediately hits the back button indicates you did not make a good enough first impression or they could not find what they were looking for. The Page/ Session column represents the average page depth or the average number of pages viewed per session. Other words, how many pages did they view before they left your website. Obviously the higher the number the better. We want to engage with and provide our online visitors with the info they are looking for. Average Session Duration allows us to know how long the average visitor stayed on our website. Once again, the longer the better. There is an enormous amount of informative takeaways we can use simply by taking time to study web analytics. Hopefully you will take action and learn about your web visitors behavior to help you decide if you need to buy a mobile friendly website using the above info as a guide. according to a survey by Google 48% of users said that if a site did not work well on their smartphone, it made them feel like the company did not care about their business. I don’t know about you, but when Google makes a statement like this… I listen. Being the number one search engine I want to make Google happy. And if Google thinks it is important websites are mobile friendly, I do too. And after all, it just makes sense. Google wants to provide its searches with the best results. And website owners should also want to provide their visitors with a good experience.